“BST Nano Carbon, a leading San Diego-based design and advanced composites manufacturer, has announced the launch of AZTEK™ Paddles, a wholly owned subsidiary. Aztek Paddles manufactures precision-tailored, performance standup paddles designed to increase stroke efficiency, maximize power, minimize shoulder soreness and reduce fatigue. Using the industry’s first comprehensive online fitting system at www.aztekpaddles.com, each Aztek paddle is custom-engineered to fit the paddler’s physical measurements, their board type & volume, type of paddling, even their stroke style. 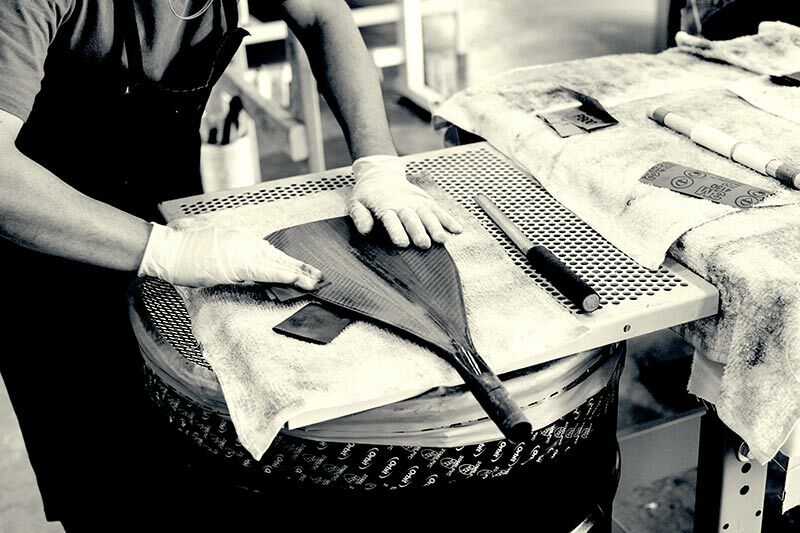 Then, each paddle is, literally, handcrafted at Aztek’s state-of-the-art facility in San Diego by composite engineers and shipped direct to the customer – all within a matter of days. Aztek Paddles features a number of patent-pending innovations including the Aztek™ Variable Flex Profile shaft technology which stores and releases energy to maximize power and stroke efficiency, and the Aztek™ TradeBlade system, which allows the customer to change between blade designs (or replace a damaged blade) with a twist of a wrench giving them a ‘quiver’ of paddles with a single shaft and handle. And, easier transport by simply removing the blade. “Aztek Paddles stems from the same discipline, design & materials expertise and craftsmanship that our team has used over the years to make many other high-performance sporting good products as well as precision structures for the military, auto racing and aerospace,” said Bill Wood, senior vice president of BST Nano Carbon’s Worldwide Sales and Marketing. “We approached creating a better paddle very seriously – gathering input and mountains of data from top paddlers and experts around the world. Then, challenged our design & materials engineers to develop the optimum paddle. No limits. No preconceptions. The result is a paddle that acts as a single system – handle to blade tip – that is engineered and handcrafted just for that customer.” Aztek Paddles has plans in the works to expand to other paddling and rowing disciplines in the near future. BST Nano Carbon brings together thought leaders and acclaimed scientists from the advanced composites arena, decades of complex manufacturing expertise, experienced leadership and an award-winning reputation for quality and exceeding its customers’ expectations. The company is a recognized leader in the advanced resins, polymers and carbon fiber industry, and has evolved to focus on nano carbon composites for use in the latest era in advanced design and manufacturing opportunities, including expertise in carbon nanotubes (CNTs), graphene and synthetic spider silk, among others. BST Carbon Nano is headquartered in San Diego with east coast operations located in the Boston, MA area. For more information, visit www.bstnano.com.